Having properly installed wheel covers — a term also sometimes used interchangeably with hubcaps — can not only help to maintain the overall performance of a car’s wheels so that they last as long as possible, but they make your ride look stylish as well. Finding the best wheel covers for your vehicle means reading reviews, studying product features, and diving into the ins and outs of available materials and configurations. With the right wheel covers, keeping your wheels rolling in peak performance can become a quick, over-and-done with task. We reviewed dozens of wheel covers to identify the best of the best, based on Amazon reviews, how well they performed in tests, cost, and other considerations. We narrowed our search down to 5 of the top-rated wheel covers vehicle owners can purchase to ensure a smooth running ride. A micro-adjustable retention system provides a perfect custom fit. We’ve identified the Pilot WH553-16S-BS Universal Fit Spyder Wheel Covers as the best wheel cover out there. With a choice of sizes to fit vehicles of all makes and models, and a durable finish, this wheel cover is one that will keep your vehicle looking and running in tip top shape. These benefits allow you to enjoy more rides about town without worrying about your tires. The Pilot WH553-16S-BS Universal Fit Spyder Wheel Covers took the top spot on our list of the best wheel covers thanks to their unique micro-adjustable retention system, which provides a perfect custom fit for any wheel. They also come in a wide selection of sizes to fit vehicles of all makes and models. It boasts a durable ABS plastic construction, with a durable and lustrous finish. Those who purchased and reviewed these wheel covers appreciated that they felt sturdy, and were easy to install by following the included instructions. People liked that there was a choice of two different finishes available, and how put together they made their vehicle look. With a price tag of around of $42 for a set of four, they don’t come cheap, but the quality craftsmanship associated with the brand, as well as the ease of setup and use more than justifies that price. They have a rating of 4.0 on Amazon with more than 1,300 people reviewing them, which we think goes a long way in convincing vehicle owners to make the investment. Heat and impact resistant ABS plastic for increased longevity. The OxGord 16 inch Wheel Covers took the runner-up spot on our list of the best wheel covers, and boast a durable, heat- and impact-resistant ABS plastic construction for increased longevity. They use an adjustable steel retention ring system in order to lock into place and provide a tight and secure fit. This set comes complete with four wheel covers in order to outfit your entire vehicle. Those who purchased and reviewed these wheel covers appreciated that they were affordable and provided a sleek look to their vehicle. People found that these wheel covers stayed in place, even while driving over bumpy roads, on long trips, and through car washes. Most reviewers found they were easy to install in about 20 minutes or less. At a cost of about $35 for a set of four, they’re fairly affordable, and are less expensive than our top choice. The quality craftsmanship associated with the brand, as well as the ease of setup and use more than justifies that price. They have a rating of 3.4 on Amazon with more than 200 people reviewing them, which we think goes a long way in convincing vehicle owners to make the investment. The BDK HK993 Toyota Corolla Style Hubcaps Silver Replica Cover are an excellent choice for those looking for a wheel cover option that won’t break the bank. They are an original equipment (OE) design replica of the 2005-2007 Toyota Corolla’s wheel covers, but will also fit on any regular 15-inch inch wheel. They boast a durable and weather-resistant ABS construction, and feature an adjustable retention ring installation system to provide a fast and secure install. Those who purchased and reviewed these wheel covers appreciated that the materials seemed to be quite durable, and liked that they could quickly and easily renew the look of their older vehicle. Most people found that the metal ring stiffeners kept the wheel cover in place, although they could be a bit tricky to compress for installation. With a price point of approximately $27 for a set of four, these wheel covers are a solid choice for those looking for a wheel cover option on a budget. They have a rating of 3.7 on Amazon with nearly 600 people reviewing them, which we think goes a long way in convincing vehicle owners that this budget-friendly pick is just as good at protecting their wheel as more expensive options. Durable triple chrome plated finish resists extreme temperature and corrosion. 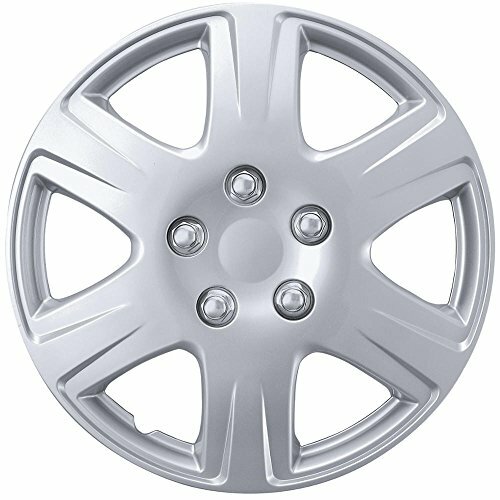 The CCI IWC435-17C 17 Inch Bolt On Chrome Finish Hubcaps are a great choice for those looking for a wheel cover with the premium look of chrome. The durable, triple chrome plated finish has been specially designed to resist extreme temperatures and corrosion for added longevity. They boast an adjustable steel retention ring system that helps to ensure maximum grip to the wheel for the most secure fit. This particular wheel cover is suitable for use with 17-inch wheels. Those who purchased and reviewed these wheel covers appreciated that they were easy to install and made their vehicle look great. People liked that they bolted on for a more secure and theft-proof solution, and were a fraction of the cost of OEM covers. With a price tag of around $58 for a set of four, they don’t come cheap, but the quality craftsmanship associated with the brand, as well as the ease of setup and use more than justifies that price. They have a rating of 4.7 on Amazon with nearly 100 people reviewing them, which we think goes a long way in convincing vehicle owners to make the investment. An exciting way to add a stylish look to a vehicle. 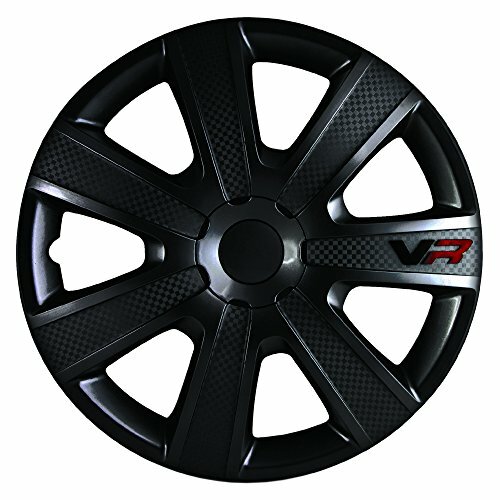 The Alpena 58260 VR Carbon Wheel Cover Kit offers a exciting way to add a stylish look to any vehicle, and are available in either 15-inch or 16-inch size to suit a variety of vehicle makes and models. They use an adjustable retention ring system that helps to ensure maximum grip to the wheel for the most secure fit. These covers are made in Europe, and boast a stylish thick spoke design. Those who purchased and reviewed these wheel covers appreciated the quality and value these covers provided, and even those with very little vehicle knowledge found them easy to install. Even on long rides over bumpy terrain, reviewers said these covers stayed secure. At a cost of about $46 for a set of four, they don’t come cheap, but the quality craftsmanship associated with the brand, as well as the ease of setup and use more than justifies that price. They have a rating of 4.1 on Amazon with more than 500 people reviewing them, which we think goes a long way in convincing vehicle owners to make the investment. Wheel covers are an ideal choice for anyone with a vehicle, as they offer an added level of protection to the lug nuts and wheels so that they last as long as possible. They are also great for those who want to spruce up their ride. There are even some wheel covers that can help to improve your vehicle’s performance. Wheel covers can be made from metal or plastic. It is important to remember that not all wheel covers fit all cars, but there is a wheel cover for every car. In order to find the right wheel cover for your vehicle, simply check your vehicle’s tire. On the sidewall of your tires, you’ll see a series of letters and numbers that ends with an R and then a number like 14, 15, or 16, etc. The number following the R is the size of the wheel cover you’ll need. Material. Once you know what size wheel covers you need, the next most important factor is the material they are made from. Wheel covers can be made from metal or a durable plastic known as ABS. Metal wheel covers tend to hold up better than their plastic counterparts, which can sometimes crack or have the finish peel off as they go through various weather cycles. Winter and road salt can be especially harsh on wheel covers. That said, metal wheel covers are much more of an investment than plastic wheel covers. Style. Another thing to think about when it comes to finding the best wheel covers for your needs is the style. There are many different spoke designs, finishes, colors, and special features available for wheel covers to make your ride really stand out. Price point. Finally, consider how much you are willing to spend on wheel covers. Wheel covers vary in price from $30-$100 or more per set. Wheel covers are a vehicle accessory that cover the entire diameter of a wheel in order to protect it from dust, dirt, and debris. Wheel covers are also important for vehicle aesthetics, and are available in a variety of colors and styles to fulfill this purpose. There are even some wheel covers that can help to improve your vehicle’s performance. Wheel covers can be made from metal or plastic. What is the difference between a hubcap and wheel cover? While many people use the terms hubcap and wheel cover interchangeably, there is a small distinction between the two. The difference between a hubcap and a wheel cover is the size. A hubcap is designed to cover only the lug nuts, which hold the wheel on the vehicle. A wheel cover, on the other hand, is designed to cover the entire diameter of a wheel, and therefore protects the lug nuts in addition to a large portion of the wheel. Do wheel covers fit all cars? Not all wheel covers fit all cars, but there is a wheel cover for every car. In order to find the right wheel cover for your vehicle, you’ll need to check your owner’s manual, or check your vehicle’s tire. How are wheel covers measured? Wheel covers are measured in order to fit a specific tire, and you can easily tell what size wheel cover you’ll need by checking your vehicle’s tires. On the sidewall of your tires, you’ll see a series of letters and numbers that ends with an R and then a number like 14, 15, or 16, etc. The number following the R is the size of the wheel cover you should use. We looked at 20 other wheel covers. Even though they didn’t make our 5 best wheel covers list, they’re the best of the rest and each is still a great option for your vehicle. The information you’ll need to compare each one is included with the listing. These chrome wheel covers boast a micro-adjustable retention system in order to provide a perfect custom fit, and are suitable for use with a wide variety of vehicle makes and models. These chrome wheel covers are suitable for use on 16-inch wheels, and boast a universal fit for vehicles of various makes and models. 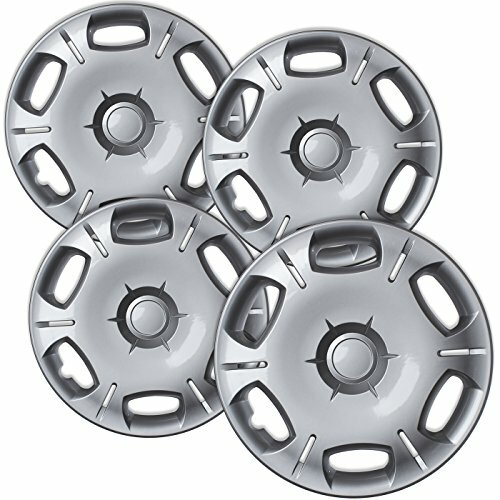 These chrome wheel covers are suitable for use on 16-inch wheels, and boast a triple plated chrome finish. They can be used with Chevrolet/GMC styled steel wheels. These chrome wheel covers boast a micro-adjustable retention system in order to provide a perfect custom fit, and are corrosion- and rust-resistant for added longevity. 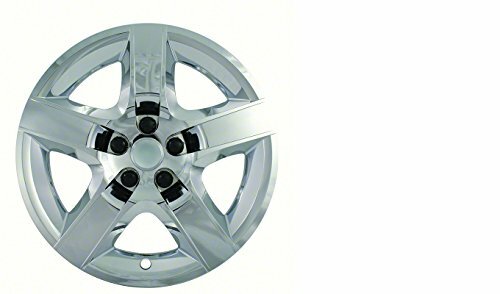 These chrome wheel covers are suitable for use on 20-inch wheels, and boast a triple plated chrome finish. They snap on for a quick and easy installation. These ABS wheel covers are suitable for use on vehicles with 17-inch wheels, and boast a tool-less installation as they simply snap securely into place. These ABS wheel covers are an original equipment (OE) design replica suited for use with 2012 and 2013 Toyota Camry models. They will also fit most regular 16-inch wheels. These ABS wheel covers have been specially designed to fit 2013 and 2014 Honda Civic models, and feature a retention ring installation system. These ABS wheel covers have been specially designed to work with 2004-2010 Toyota Siennas, and boast an adjustable steel retention ring system to lock securely into place. These ABS wheel covers are an original equipment (OE) design replica designed to fit 2003 and 2004 Toyota Corollas, and also fit most regular 15-inch wheels. These ABS wheel covers boast a stylish five spoke design, and come complete with decorative lug nuts designed to fit over your wheel’s actual lug nuts. These ABS wheel covers are an original equipment (OE) design replica suited for use with 2014 Toyota Corollas, and use an adjustable steel retention ring installation system. These black wheel covers boast a sleek seven spoke design, and use an adjustable ring installation system to provide a fast and secure fit. These black wheel covers are an original equipment (OE) design replica suited for use with 2006-2011 Chevrolet Impalas, and are suitable for use in all road conditions. These black wheel covers are an original equipment (OE) design replica suited for use with 2010 and 2011 Toyota Corollas, and can also be used on most regular 16-inch wheels. These black wheel covers boast a sleek and stylish matte finish to quickly upgrade your vehicle’s appearance, and come complete with chrome decorative lug nuts. These black wheel covers are an original equipment (OE) design replica suited for use with Chrysler Turismas, and can also be used on regular 15-inch wheels. These black wheel covers have been designed to fit 15-inch wheels on most foreign and domestic vehicles, and use a micro-adjustable retention system to provide a custom fit. 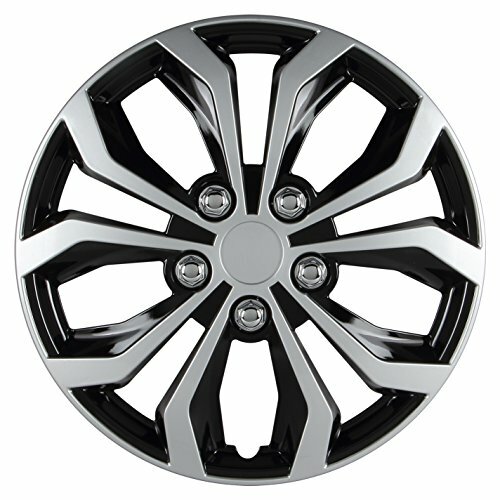 These black wheel covers have been designed to fit most 17-inch steel wheels, and boast a unique 3-step retention system to ensure a tight and secure fit.